If you own a swimming pool, you probably know how important it is to maintain the pH in a range between 7.2 and 7.8. The pH value is a measure of water acidity/alkalinity, and when it's too high, the chlorine you add to the pool doesn't sanitize well. When the pH is too low, on the other hand, the water becomes corrosive. If you need to lower your pool's pH, you do so by adding an acid -- typically muriatic acid or sodium bisulphate. When you need to raise the pH, you can add baking soda, but only if the total alkalinity of the water is also low. If the alkalinity is in the proper range or high, you should use soda ash to raise pH. Add baking soda to your pool water to raise the pH and make the water more comfortable for swimming. Whether the water you use to fill your pool comes from a well or a municipal water source, it's more likely to be alkaline than acid, and you usually have to bring the pH down to properly sanitize the water with chlorine. Basic chemistry tells us that you do this by adding an acid to the water. Pouring in muriatic acid -- a weak form of hydrochloric acid -- is a quick way to lower pH, but many pool owners opt for dry acid, or sodium bisulphate, because it's a powder and safer to use. 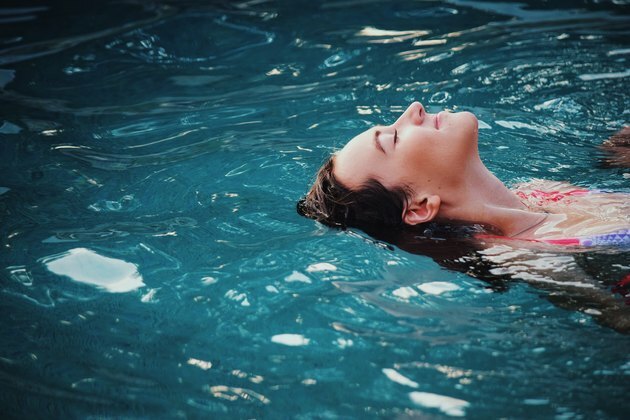 Adding too much chlorine or too much acid can lower pH and, with it, total alkalinity -- which is a measure of the water's ability to maintain a stable pH. When the pH and alkalinity fall, acidic water can cause itching skin for swimmers and may stain or corrode the pool liner, ladder and other pool components. Baking soda (sodium bicarbonate) is naturally alkaline, and adding it to the water raises the pH and alkalinity. Baking soda isn't always the best chemical to use. When the pH is low, the total alkalinity is usually also low, but in rare cases, the alkalinity may be in the proper range -- between 80 and 120 parts per million -- while the pH is below 7.2. In such cases, it's better to use soda ash (sodium carbonate) to raise the pH. It does so quickly, without affecting total alkalinity. You won't have enough baking soda in your kitchen cupboard to treat your pool -- you typically need from 7 to 9 pounds to treat 10,000 gallons of water. While some supermarkets may stock baking soda in large containers, you're sure to find large quantities at pool supply outlets. It's to your advantage to buy from a pool supplier, because the container will specify how much of the product to add to your pool. Wherever you buy baking soda, make sure the label specifies that the product inside is sodium bicarbonate. When you test the pool pH, test also for total alkalinity. If the pH is low, the alkalinity will probably also be low, and the amount you need to raise it helps determine how much baking soda to add. If you buy the baking soda at a pool supplier, the instructions on the container will specify how much to add, based on the current alkalinity concentration and the volume of your pool. Be sure to buy enough product. For most applications. you'll need 10 pounds or more. Test the water for pH and total alkalinity using test strips or a pool test kit. Add baking soda if the pH is below 7.2 and the total alkalinity is below 80 ppm. If the pH is low but the alkalinity is in the proper range, use soda ash to raise the pH. Follow the instructions on the container. Some manufacturers recommend diluting the baking soda in water before adding it to the pool, while others recommend simply pouring it in. If you use baking soda from the supermarket, you can usually just pour it straight into the pool. Dust it over the surface rather than pouring it in one spot to help the product dissolve faster. Circulate the water for an hour or so to disperse the product, and then turn off the pump and let the pool sit for about six hours. Retest the water, and add more baking soda as needed until the alkalinity and pH are in the acceptable ranges. What Is Soda Ash for Pools?